Do hornets fly far from their nests? Jump Menu: Do hornets fly far from their nests? 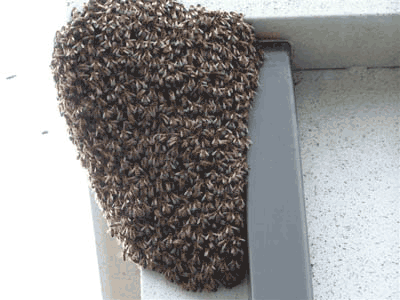 Would honey bees nest in a chimney? What does a wasp nest look like when it starts? How long does a queen wasp live? Does the queen wasp stay in the nest when all the others leave in winter? Yes, hornets and wasps can fly a considerable distance from their nests when foraging for food. When a food source is located, the position is relayed back to the nest so other workers can exploit the food source until it is depleted. Would honey bees nest in a chimney? Honey bees are renowned for nesting in chimneys; in fact, we think it is their favourite nesting location. It is quite rare for wasps to nest in chimneys although we do see this on occasion. If you have a honey bee nest in your chimney, you will have bees falling down the flu every day and entering the house through the fireplace. You will also be able to hear the bees up the flu. 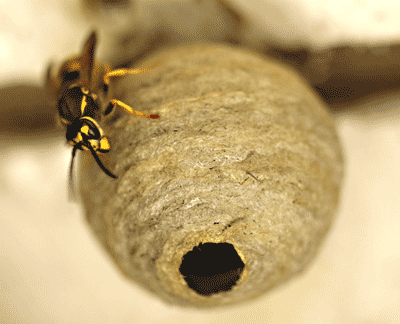 What does a wasp nest look like when it starts? A starter wasp nest looks like a grey golf ball suspended from something. The nest starts with a stalk; then over a week or two, a shroud will be built around it. From this point, the nest will gradually get larger. How long does a queen wasp live? A queen wasp or hornet will live for one year. After hatching in the autumn, she hibernates over winter, builds a brand new nest in the spring, lives in the nest throughout the summer. She will produce new queens in the autumn and then die along with all of her workers. Does the queen wasp stay in the nest when all the others leave in winter? A queen wasp dies in the autumn along with her workers. She hatches new queens ready for the following year.